Waiting for sunset at the top of Mauna Kea, there are many distractions – shiny telescopes, other sunset watchers, pillowed clouds, and plummeting temperatures. By the time I returned to the car I was ready to turn up the heat, a rare opportunity in Hawaii. 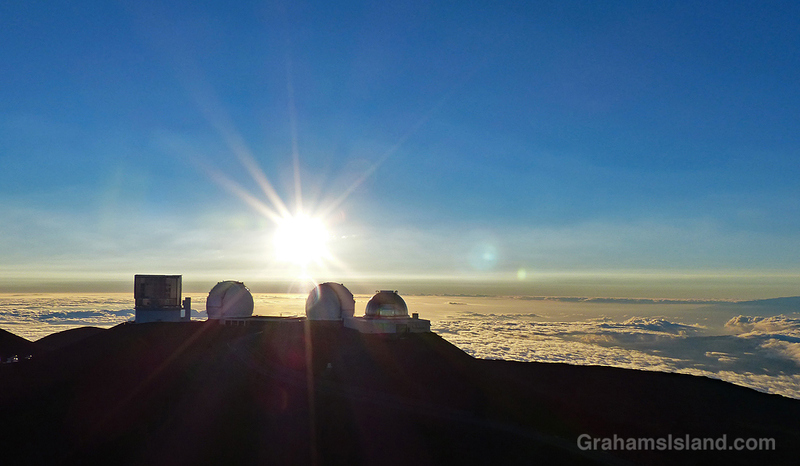 The telescopes are from left: Suburu Telescope, The two telescopes of the W. M. Keck Observatory, and NASA Infrared Telescope Facility. At least I picked a good day for the trip. It snowed up there yesterday!